south of the howard frankland. 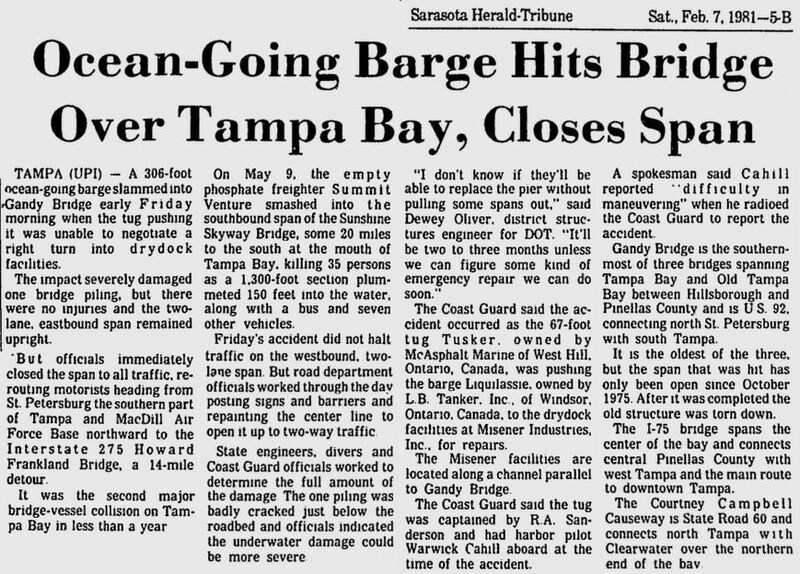 it was the longest automobile toll bridge in the world when it opened. Officer James Wilcher and his friend Chip Roberts saved a man who jumped from the Gandy Bridge in Tampa Bay. An off-duty police officer looking for some relaxation found himself in the middle of a rescue Wednesday, the Tampa Police Department said. Officer James Wilcher and his friend Chip Roberts were fishing near the Gandy Bridge in Tampa Bay when they saw a man jump from the bridge. They moved their boat over to the man and held onto him for about 30 minutes until a police boat could arrive. The police boat took the man to an ambulance, which took him to a local hospital for treatment. 08.23.18, fox13news.com, off-duty Tampa officer, friend rescue man who jumped from Gandy, police say. 08.23.18, bradenton.com, When a man jumped from a bridge, police video shows an off-duty cop came to his rescue. 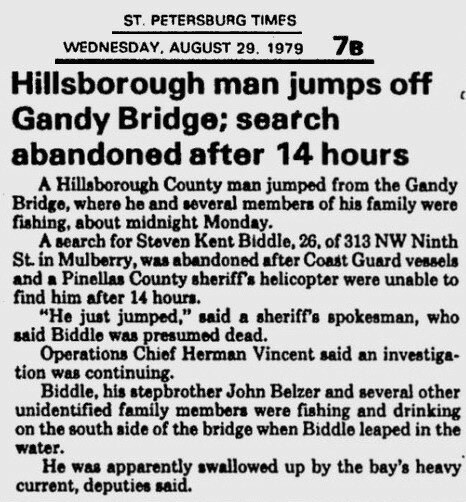 ST. PETERSBURG — A woman who jumped off the Gandy Bridge on Thursday was rescued by two men fishing nearby, according to the Pinellas County Sheriff's Office. The men, who were not acquainted with each other, told deputies they were standing on the rocks on the south side of the bridge when they saw 23-year-old Sophie Dao jump about noon. 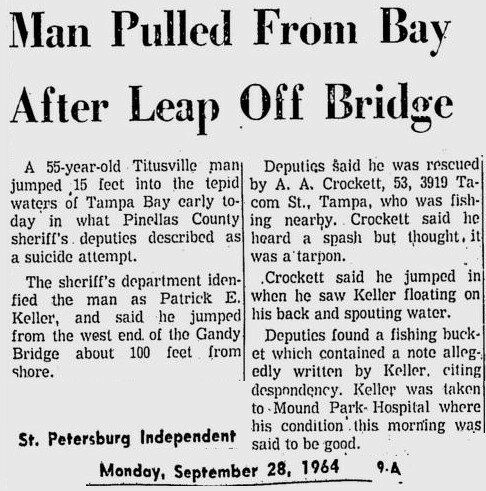 According to deputies, Nedzed Crnalic, 47, of St. Petersburg saw the woman walk about 100 feet onto the bridge. She then climbed over the railing and jumped. While Crnalic was preparing to help, 36-year-old Shan Bran­han of Tampa jumped in the water and swam to Dao, who was struggling and screaming for help, deputies said. Both men assisted in Dao's rescue. Paramedics and deputy sheriffs arrived shortly after. Deputies report that Dao, who is from Largo, was treated at the scene and taken to St. Anthony's Hospital for observation.